I was their 26th meeting, their 13th final, and it was the Egyptian who extended his advantage to 17-9 with a four game win that, at times, left Matthew wondering what he had to do to stop the flow of points coming from his opponent's racket. Not that the Englishman did anything wrong, but when Ashour's game is on song, as it was in the last two games as he displayed incredible retrieving and shotmaking abilities, there is precious little anyone can do about it. 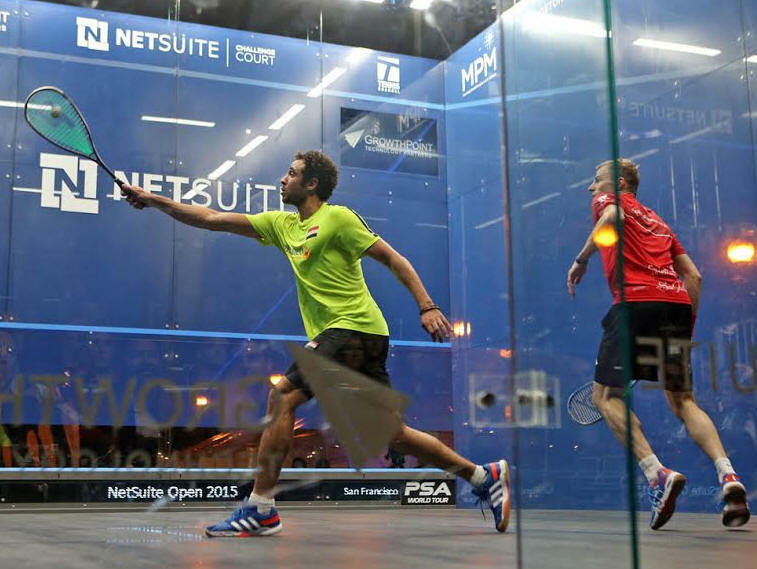 Egypt’s Ramy Ashour added a 37th career PSA World Tour title to his impressive collection after defeating three-time World Champion Nick Matthew in the final of the 2015 NetSuite Open in San Francisco today. 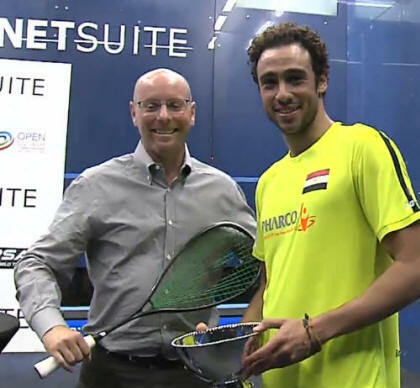 Competing in his first tournament since April Ashour, who has been dogged by injury since limping off court against Matthew during the 2013 World Championship semi-finals, was in sublime form as he out-gunned the 35-year-old Englishman to take the match 3-1 and get his latest comeback off to the perfect start. 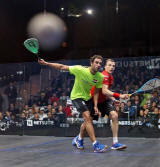 The opening exchanges of the encounter were blighted with errors before Ashour managed to string together a series of winners to take the first game 11-7. However Matthew came out strong in the second, levelling the scores at 1-1 after a controversial overrule from the video referee at 10-9 handed him the game, much to the dismay of his opponent. But Ashour, competing on the day before his 28th birthday, recomposed himself and got off to a flying start in the third game - easing into a 5-0 lead. 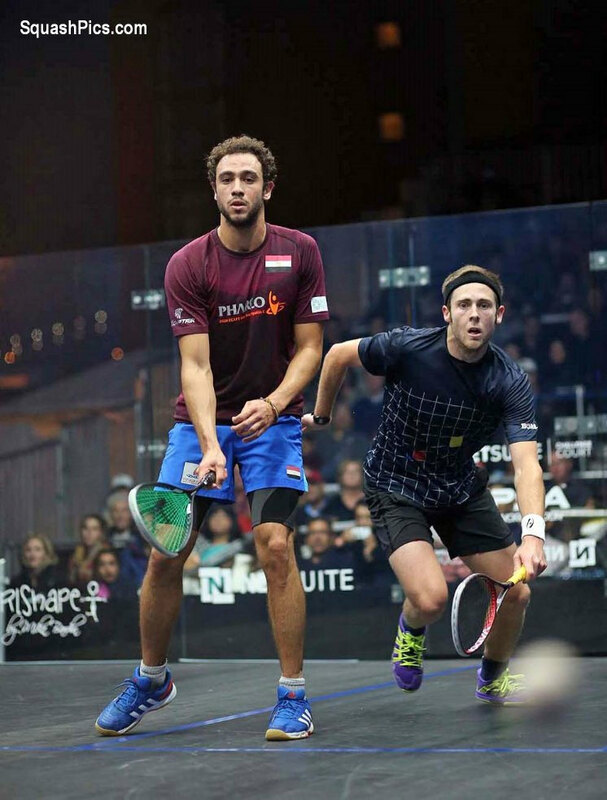 Matthew dug in to mount a comeback but he couldn’t live with Ashour’s pinpoint accuracy and unpredictable shot-making talents. 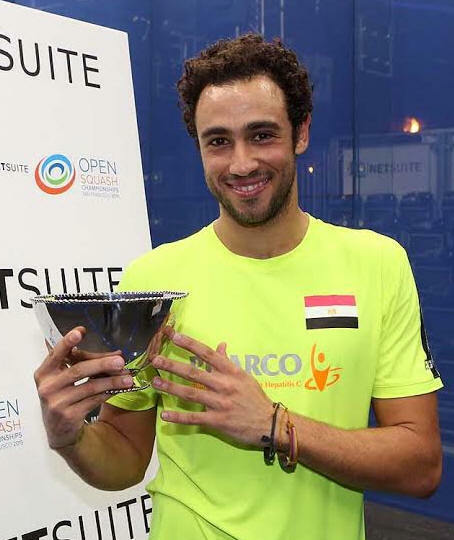 With a 2-1 advantage secured Ashour continued his barrage in the fourth and sealed the match, and his second NetSuite Open title, after 59-minutes on court. 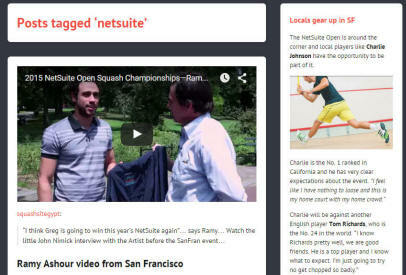 “It feels great to be back in San Francisco and to win this title for a second time,” said Ashour, who beat Gregory Gaultier in the 2013 NetSuite Open final. “I’ve always had a great rivalry with Nick and we’ve gone back and forth against each other over the years. He’s a great athlete and a great ambassador for the sport and it takes a lot to beat him - he keeps you on your toes and you really have to dig in against him. 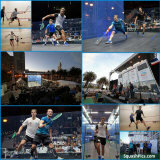 “Every time I go on court I try to give 100 per cent. I’m always trying to learn from every player on court because there is so little between the top players these days. 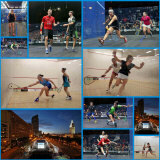 I know what I can do on court but it can be anyone’s victory on any day." 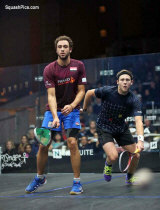 “I kept telling myself in the fourth game that it wasn’t over but Ramy is a different kettle of fish,” said Matthew – who had saved multiple match balls during his quarter-final encounter with German Simon Rösner. “How a guy as good as him doesn’t get the chance to grace the Olympic Games is a joke really - you’re scratching your head against him at times but I’ll go away and keep working to catch him and World No.1 Mohamed Elshorbagy. 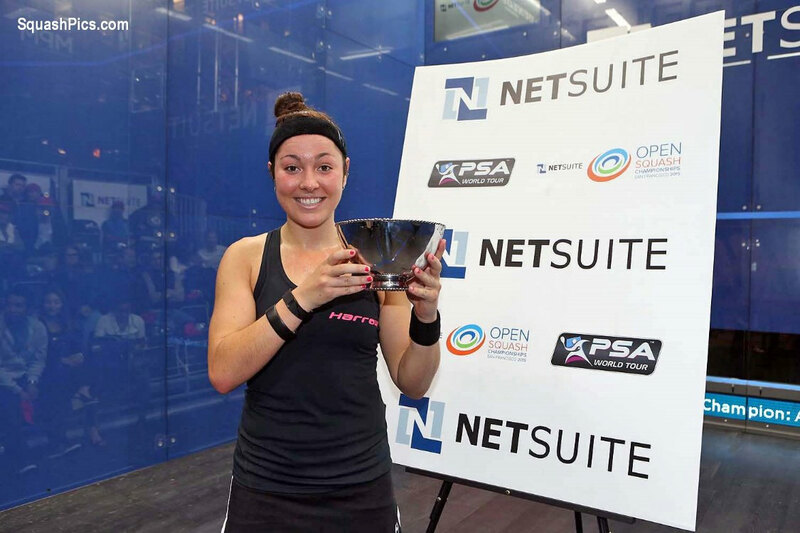 American number one Amanda Sobhy delighted a capacity crowd in San Francisco earlier today when she defeated England’s Sarah-Jane Perry to claim the 2015 NetSuite Open title. 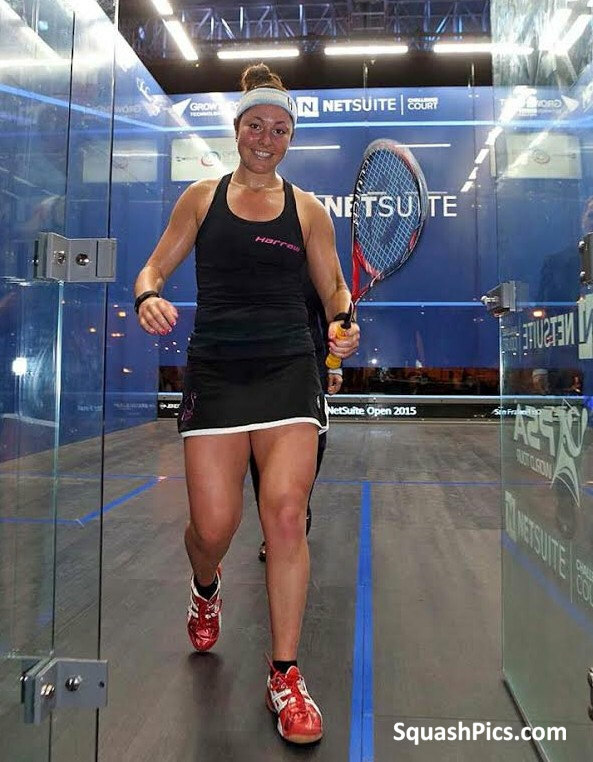 Sobhy reached the final dropping just one game en route, to line up against second seeded Perry who had triumphed in their only previous PSA meeting, but it was the world #19 who took the spoils, clinching the title on her third match ball to rapturous applause. “I’m feeling great right now and I’m just really happy to get the win here tonight,” said Sobhy. “It was a big goal of mine to come here and perform well, especially leading up to the US Open - I’m playing SJ again there in the first round and I know she’ll come back stronger. 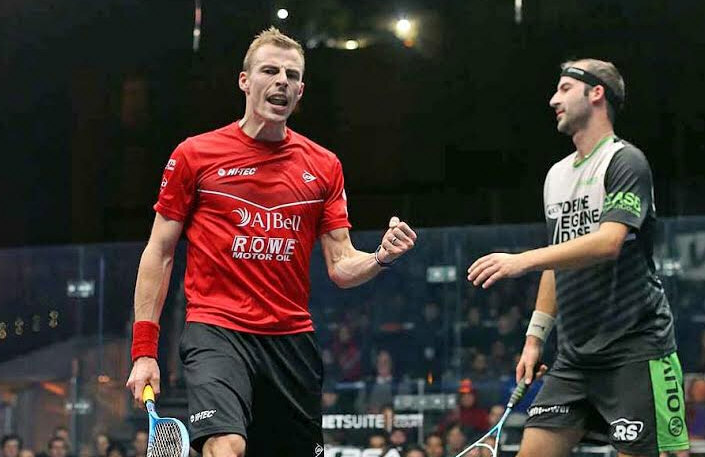 In the men's semi-finals top seed Nick Matthew increased his winning streak over Miguel Rodriguez to six with a four-game win, while world champion Ramy Ashour maintained his winning record over second seed Gregory Gaultier, coming from two-one down to beat the defending champion. Matthew tweeted: "Good to get back to the business of what we do best after the [Olympic] disappointment of today. Great crowd again." Rodriguez admitted: "It was not a good night for me, he was very accurate today and I could not find my depth on court tonight." 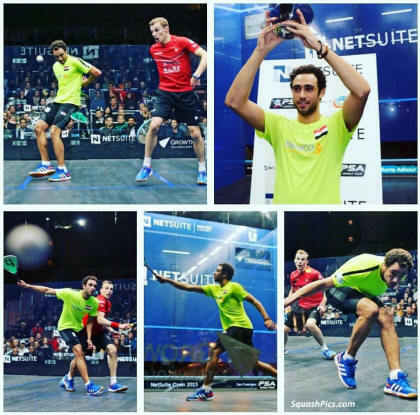 Ashour, who has only competed at three events during an injury-blighted year, secured a place in his 54th PSA final where he’ll be hoping to claim title number 37. 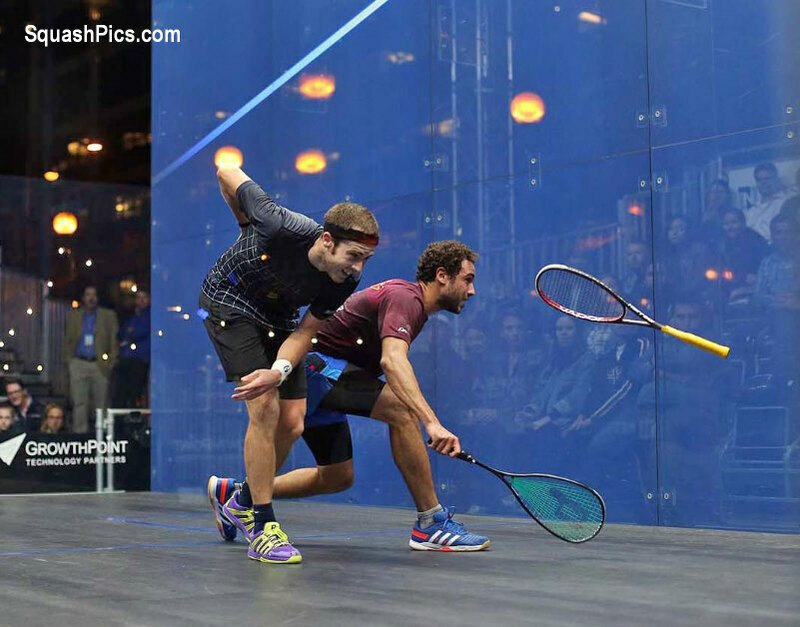 The Egyptian took the opening game but Gaultier struck back to level, then take the lead after missing out on several game balls in the third. 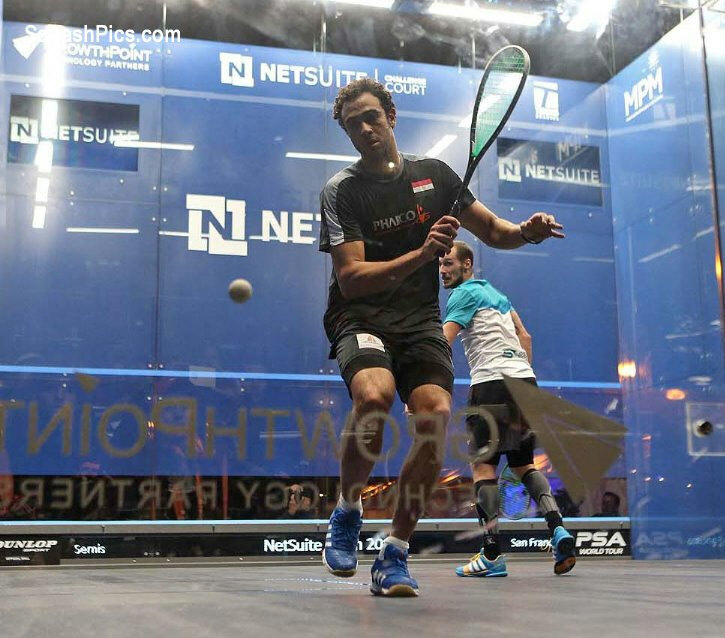 Ashour dominated the final stages though, taking a 7-0 lead in the fourth before finishing off the match 11/2, 11/3 in just short of the hour mark. 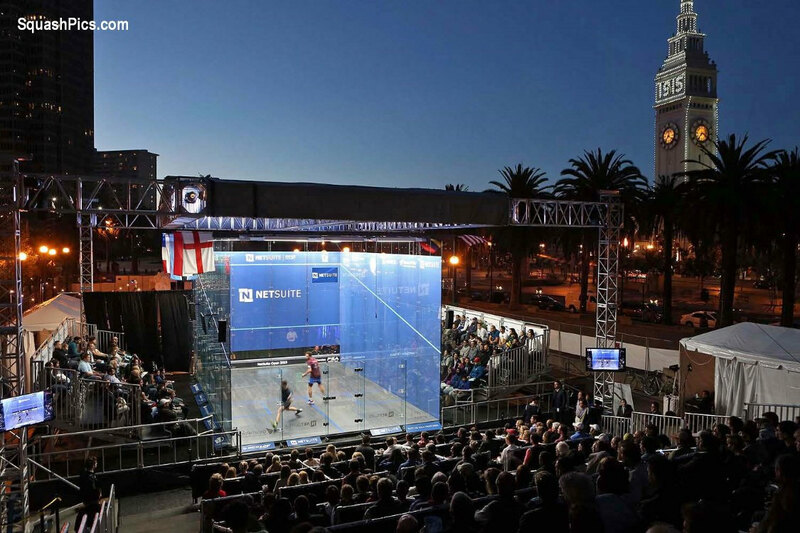 “It’s amazing to be back in San Fran – there’s a great energy from the crowd here and it’s good to be here and be performing well,” said Ashour. “To play against someone like Greg takes a lot out of you – he’s a top athlete and it’s not easy to play him – and it’s the same against all the top ten players. 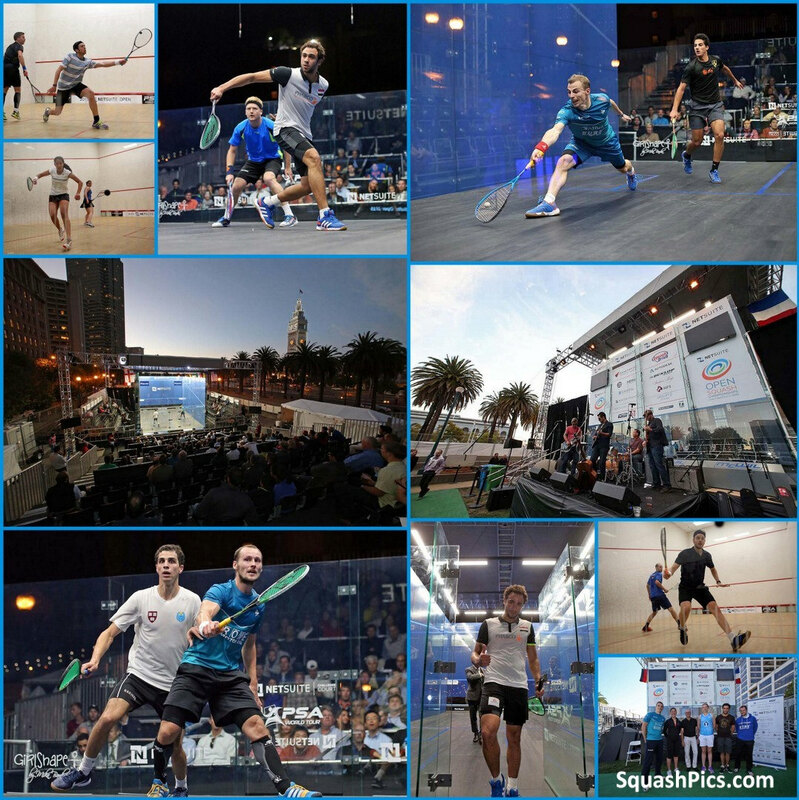 Defending champion Gregory Gaultier kept alive his hopes of retaining the trophy, and of claiming the title for the third time overall, following a thrilling four-game encounter with England’s James Willstrop in San Francisco. The enigmatic Frenchman was taken to the brink against Egyptian Ali Farag in the first round of action but showed no signs of any physical weariness as he took the opening game in just nine minutes. But Willstrop, who has been slowly recovering from a career-threating hip injury during the past 12 months, responded in style, showing glimpses of the form that saw him top the world rankings for 11 months in 2012 as he dictated the pace to level the scores. 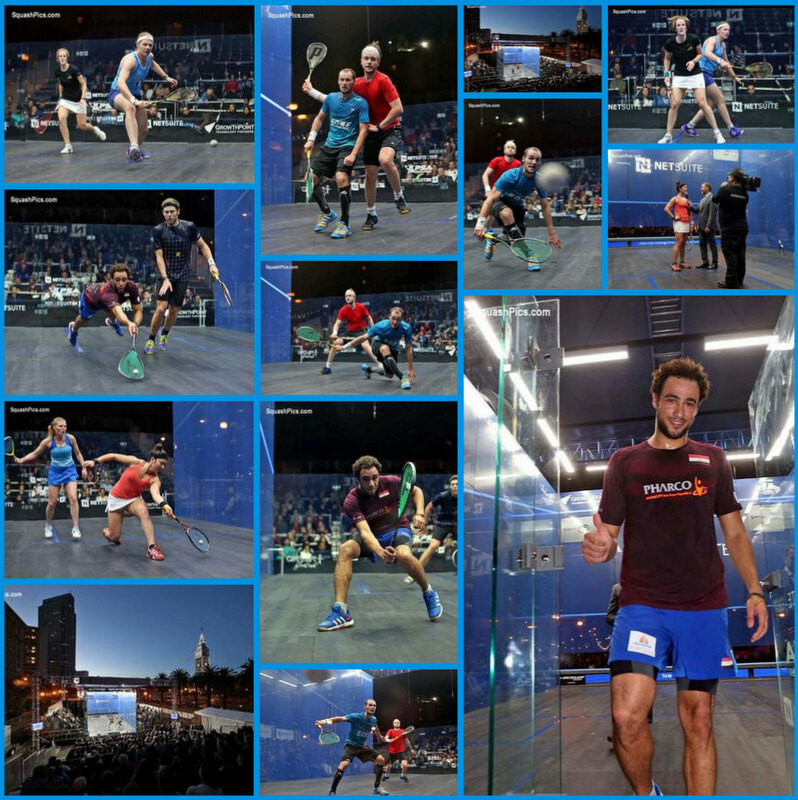 Drama, tension, and intense rallies in tight third game as both players traded winners to the delight of the crowd but it was Gaultier who edged it and the physical exertion took its toll on 6’4" Willstrop as his energy levels dropped in the fourth, allowing the World No.3 to secure passage to the semi-finals. 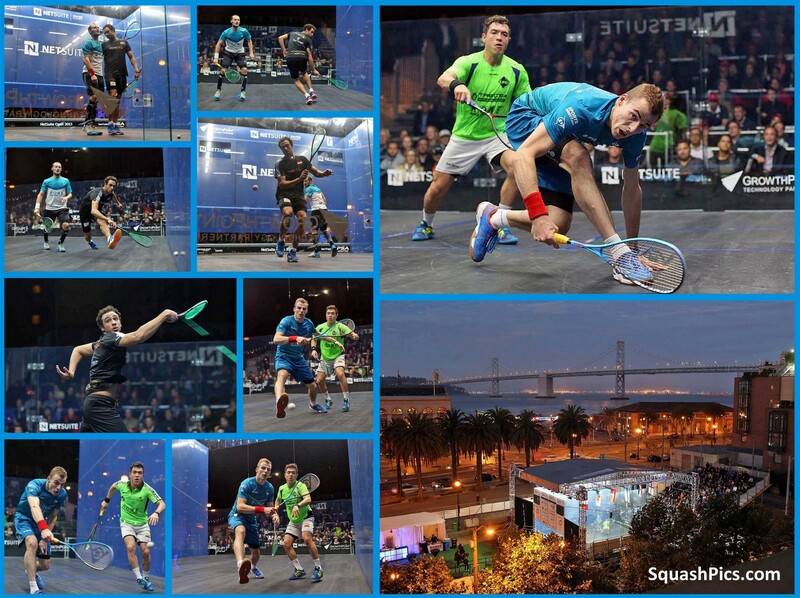 “That was a very tough four games tonight,” said Gaultier. “James is definitely improving and that’s the best I’ve seen him play for a while. At the beginning I was attacking and I could see he was struggling to move but in the second he came out and surprised me and was getting all my shots back. 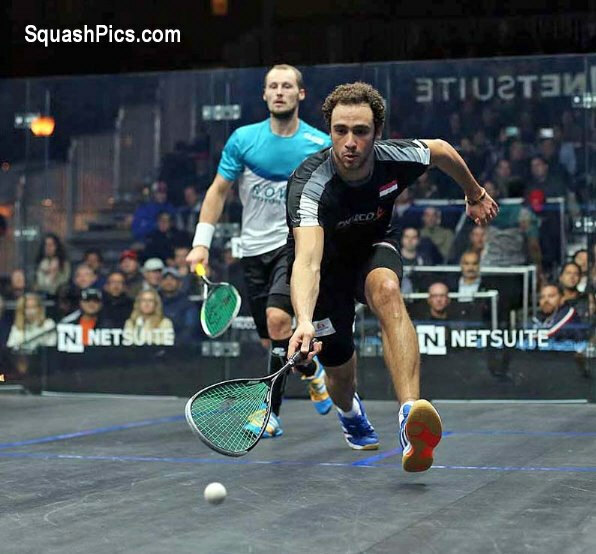 The 32-year-old from Aix-en-Provence will now take on World Champion Ramy Ashour, the man who beat him in the 2013 NetSuite Open final, when the duo will be facing off for the 31st time on the PSA World Tour. Ashour booked his last four berth with a comfortable 3-1 win over Australian qualifier Ryan Cuskelly while the top half of the draw will see top seed Nick Matthew take on Miguel Rodriguez for a place in the final. 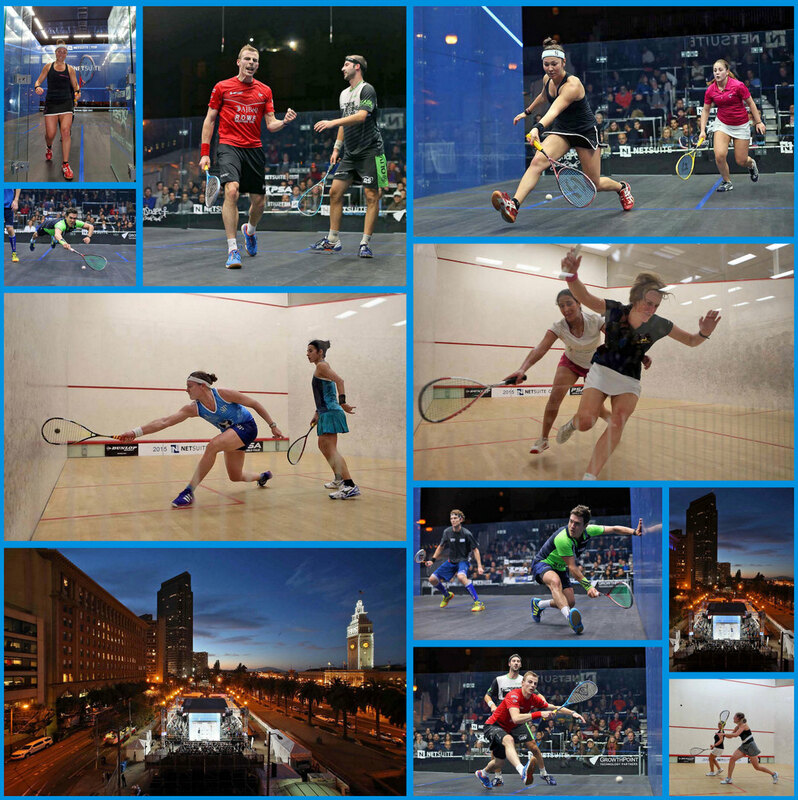 The new women's event saw the semi-finals played out, and it was top seeds Amanda Sobhy and Sarah-Jane Perry who won through to tomorrow's final as they beat Line Hansen and Victoria Lust. Top seed Sobhy produced a third emphatic win on the trot to book her place in the final after halting Denmark’s Line Hansen in four games. 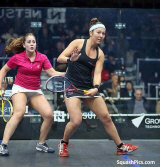 Sobhy, who saw off her previous opponents Tesni Evans and Samantha Teran in just 46-minutes combined, continued to plough her way through the draw and despite dropping a game against the world #26, she reinforced her credentials as one of the game’s most promising talents as she responded to take an emphatic fourth game 11-1 and see out the win after 34-minutes. “It was a fun match out there tonight, she used the boast well especially in that third game but I’m glad I regrouped well in the fourth to take the match,” said Sobhy. 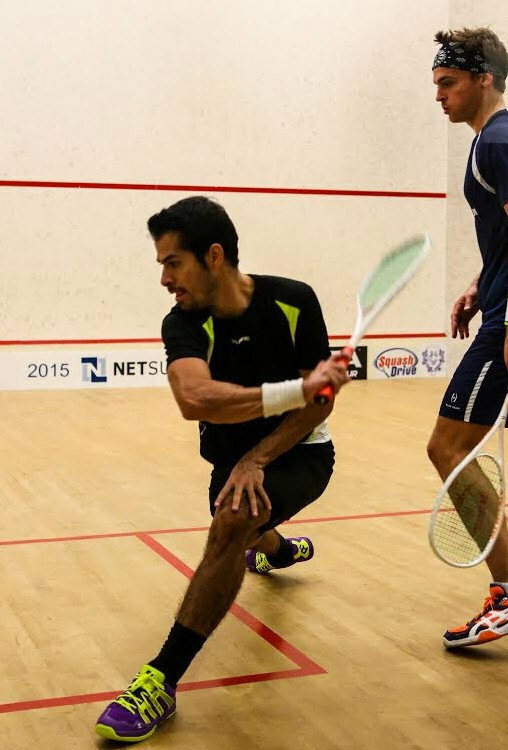 Colombian third seed Miguel Rodriguez survived a second successive five-setter as he saved match ball to edge past Cameron Pilley to reach the semi-final, while top seed Nick Matthew also saved match balls - four - on his way to a three-two win over Simon Rosner. 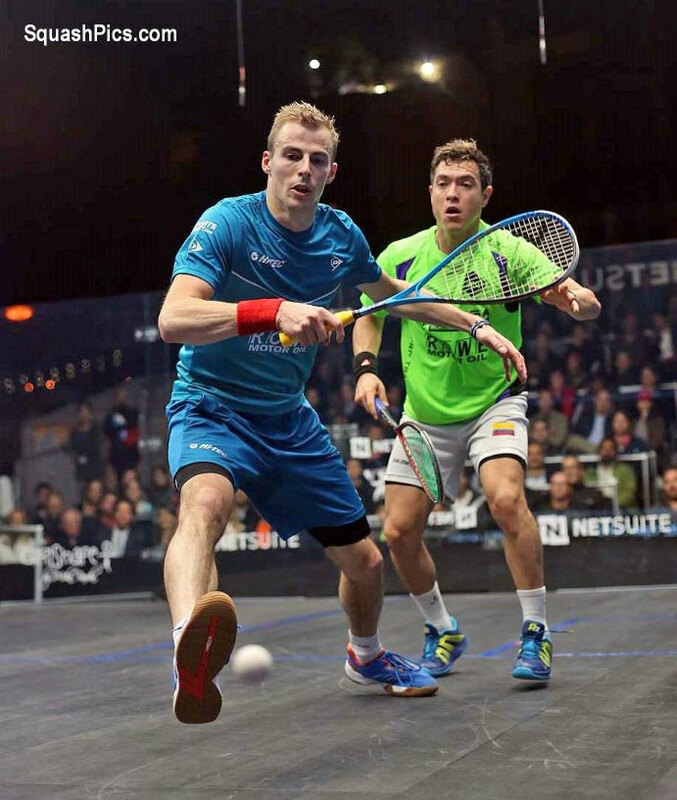 Three-time World Champion Nick Matthew was forced to draw on all his 18-years of professional experience as he came within a whisker of exiting the 2015 NetSuite Open at the quarter-final stage against German Simon Rösner. 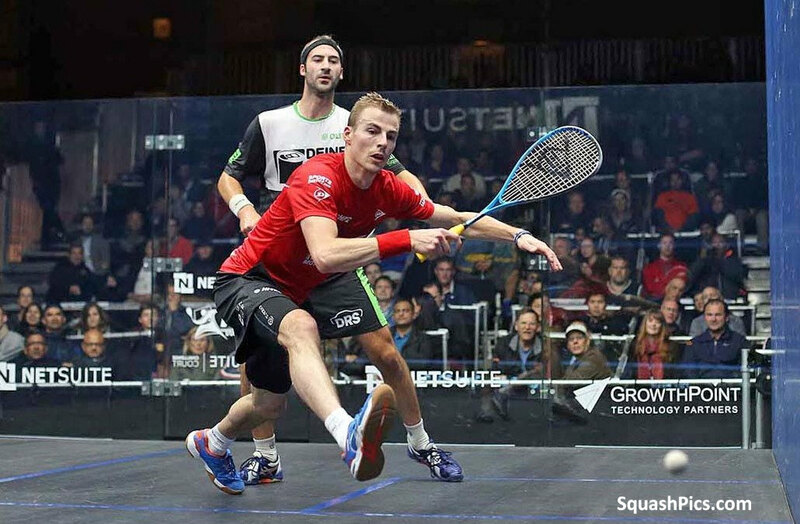 In all their seven previous meetings Matthew, the 35-year-old winner of 33 PSA titles, had never dropped more than a game against the 27-year-old World No.7 but needed all his trademark fighting spirit to keep his tournament alive when he found himself 10-6 match-ball down in the fourth game. Matthew, traditionally one of the strongest starters on tour, was behind from the off as Rösner came out firing with precision and pace to take the opening game and after sealing the third after a nervy tie-break, the powerful man from Paderborn looked on course to record a career-defining win. But Matthew called on every fibre of his Yorkshire-grit to save four match-balls and force a fifth and deciding game - which he eventually sealed 11-7 after 96-minutes of compelling, nail-biting drama. “I’ve a good head to head record against him and normally I’ve broken him down after a game or two but tonight I never felt like I did that and I had to fight for every point,” said Matthew. “He was taking the volley away from me and mentally I had to put in so much focus to every shot that I struggled to implement my game plan. I had to dig deep and all credit to him as that’s the best he’s played against me. “I used all my experience in that fourth game to make sure I didn’t panic and stay composed but aggressive as well. There were a lot of guts in there as well because I just didn’t want to lose tonight. Matthew’s opponent in the semi-final will be the entertaining Colombian Miguel Rodriguez, who secured his place in the last four courtesy of a similarly dramatic come-from-behind win over Australian Cameron Pilley in a titanic 108-minute battle. Rodriguez too was match-ball down in the fourth game against an inspired Pilley, who produced some of his best play of the last 18-months to dictate the pace and unsettle the Colombian from the start, but after a series of nervy exchanges the man from Bogota managed to save the match and force a decider - which he managed to sneak 11-8. “Cameron played very well tonight and I had to play at 100 per cent in the entire match to try and match him,” said Rodriguez. 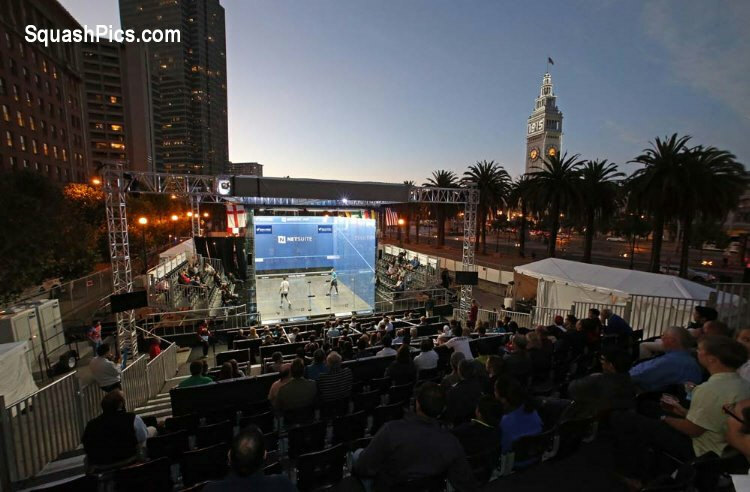 American number one Amanda Sobhy lived up to her billing as the top seed at the 2015 NetSuite Open as she emphatically saw of Welsh challenger Tesni Evans in the marquee match-up of the quarter-finals in San Francisco. 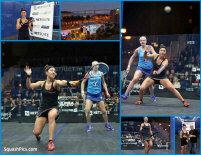 Recent Harvard-graduate Sobhy, world #19, dispatched world #28 3-0 Evans in just 26-minutes to the delight of the partisan crowd, cruising into the semi-finals where she will face Danish challenger Line Hansen, who ended hopes of an all-American semifinal as she beat Olivia Blatchford in straight games. 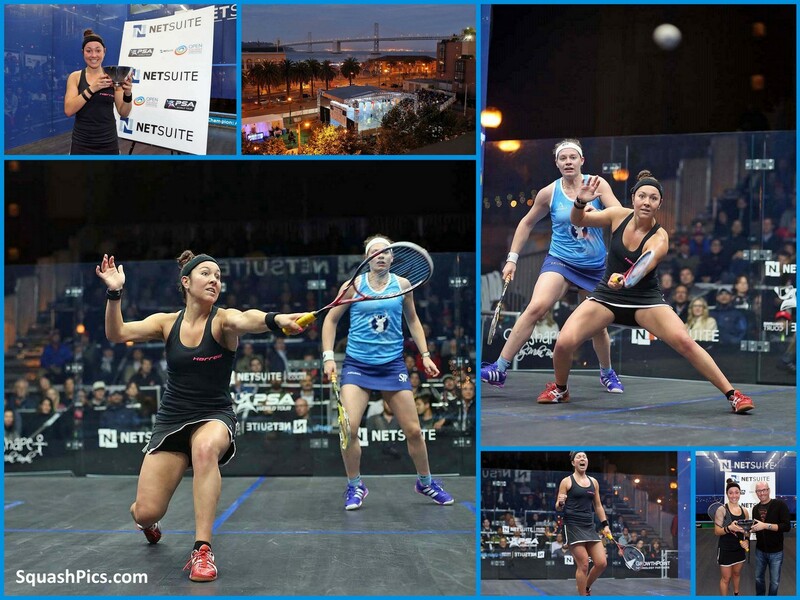 “I love playing in the US because the crowd is so amazing and when people come and support me it makes me want to push harder and play my best and to play at this venue is amazing,” said Sobhy. “I’ve finally finished with school so this year my focus is to try and enjoy being a full-time pro and not to try and squeeze in all the events I haven’t played due to studying. 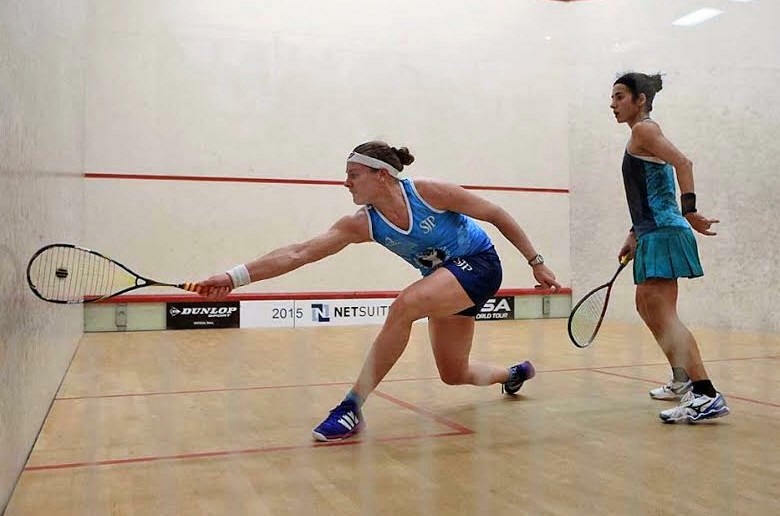 The bottom half of the draw will be an all-English affair between number two seed Sarah-Jane Perry and Victoria Lust after Perry beat Guyana's Nicolette Fernandes in three and Lust knocked out fourth seed Habiba Mohamed 3-1. 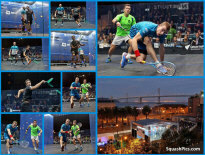 Matthew: "the better player lost"
A dramatic first day of main draw action in San Francisco, as defending champion Gregory Gaultier saves match balls before beating Ali Farag in five, Cameron Pilley upsets Peter Barker, Ryan Cuskelly beats Castagnet in 101m, Miguel Rodriguez and James Willstrop are also taken the distance, and in the new women's event home girl Olivia Blatchford beats third seed Dipika Pallikal while Tesni Evans comes from two down and top seed Amanda Sobhy gets off to a solid start. 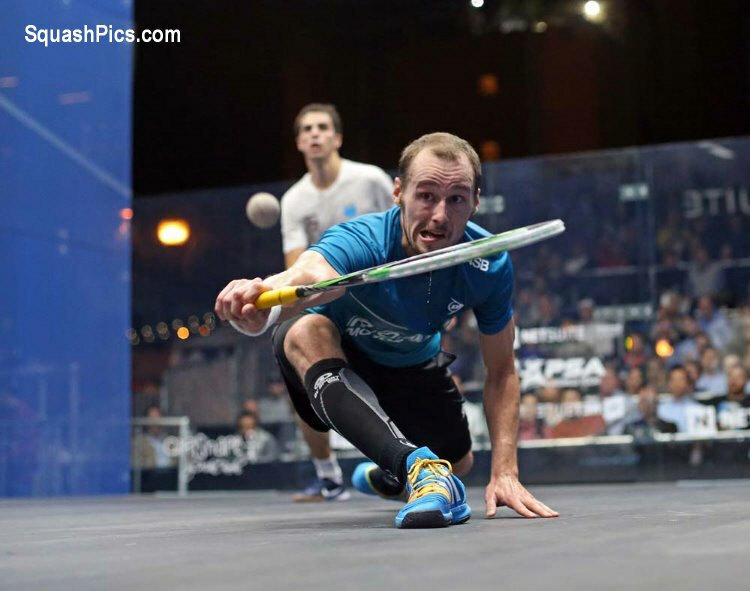 Defending champion Gregory Gaultier came within a whisker of a shock first round exit, saving multiple match balls against Egyptian Ali Farag to keep his tournament alive following a dramatic 90-minute encounter. After booking his place in the main draw after a 70-minute match with French number three Gregoire Marche, the 23-year-old from Cairo took the match to Gaultier and unsettled the French world #3 from the off and it was a strategy that paid off for the Harvard graduate as he came from 2-1 down to level the match and force a fifth game. 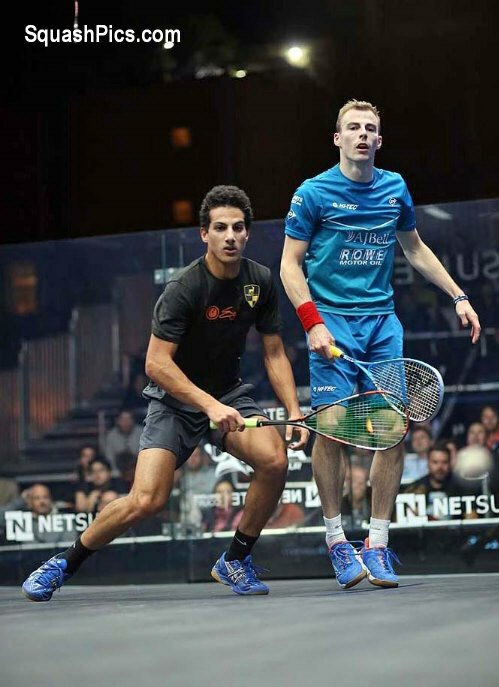 Farag’s continued aggression was rewarded when he earned himself two match balls but he couldn’t convert and it was a relieved Gaultier who eventually sealed it 12-10 in the fifth. 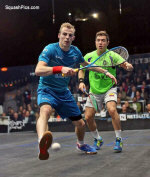 “He played so well, it was unbelievable,” said Gaultier. Top seed Nick Matthew, the world #2, and world champion Ramy Ashour, the world #5, suffered no such difficulties as they began their campaigns with comfortable victories over Mazen Hesham and Tom Richards, respectively while qualifier Ryan Cuskelly’s rich vein of form continued as he followed up his surprise win over top seeded Alister Walker in qualifying with an impressive performance against Mathieu Castagnet, taking out the world #9 3-2 after a brutal 101-minute battle. Fellow Australian Cameron Pilley also upset the seeding to take out world #8 Peter Barker 3-0. 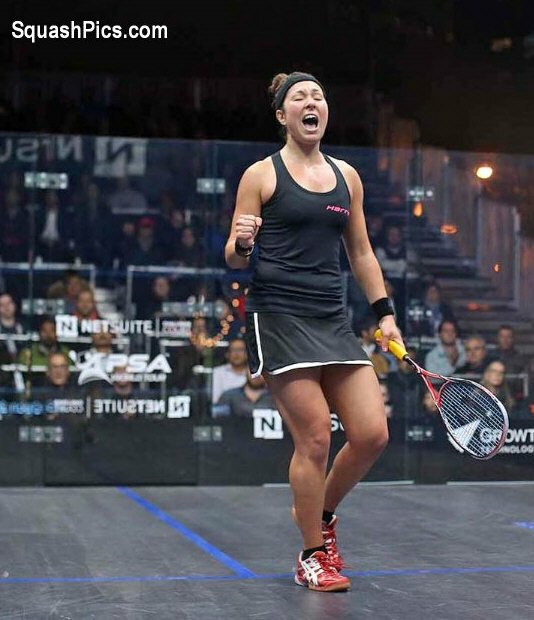 In the women’s event American number two and World No.37 Olivia Blatchford produced the performance, and shock, of the first round as she surged to an impressive 3-2 win over Indian third seed Dipika Pallikal. 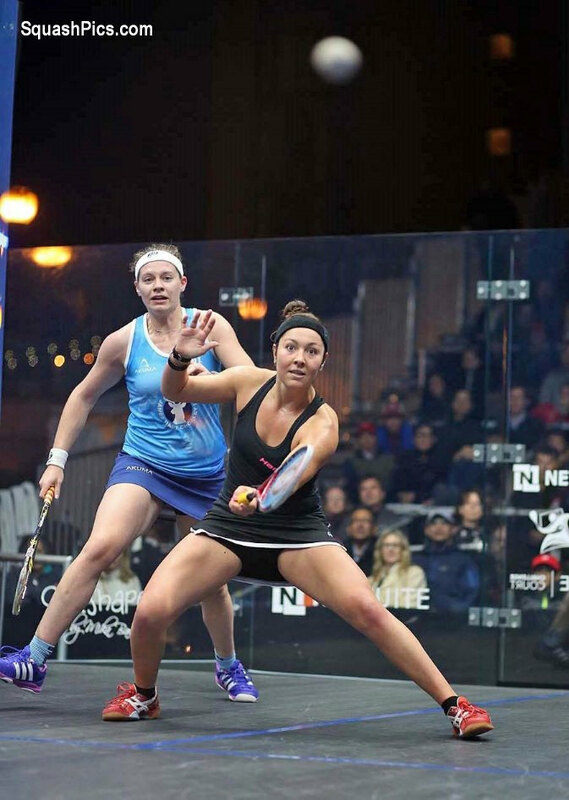 Blatchford stormed into a two game advantage only to see Pallikal mount a comeback and force a decider, but Blatchford gathered herself and showed impressive maturity as she held her nerve in a tense fifth game to take the match. She was joined in the quarterfinals by compatriot and top seed Amanda Sobhy, who saw off Mexican Samantha Teran in just 20 minutes as she bids to add a 14th PSA title to her name. 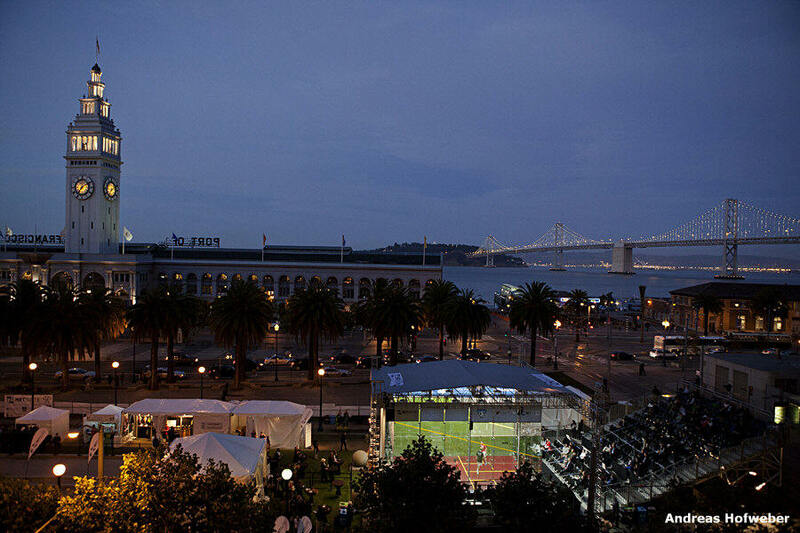 With a place in the NetSuite Open draw the winner’s reward, the competitive intensity was fierce and the players were fired up in today’s final qualifying matches at the University Club and the Bay Club-San Francisco. 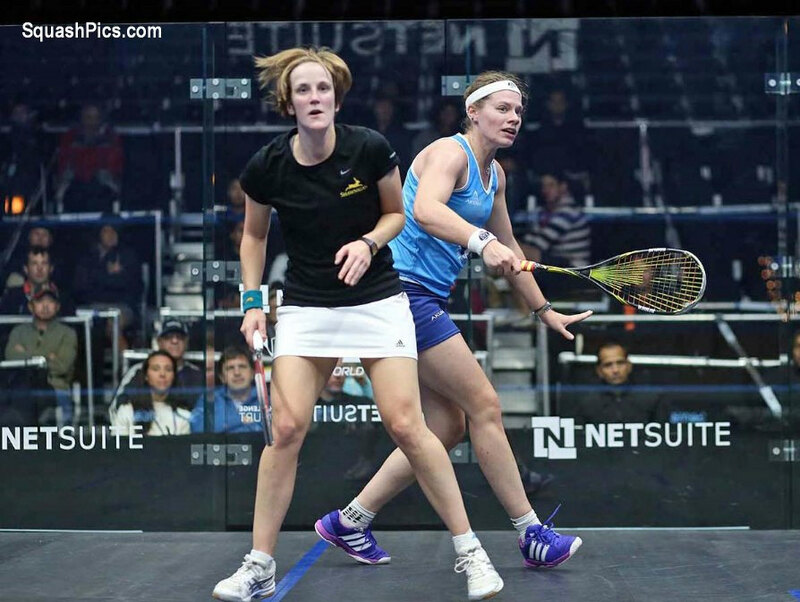 In the women’s draw, England’s Fiona Moverley was the first to stake her claim to a main draw spot with a nail biting five - game victory over top-seeded qualifier Coline Aumard. 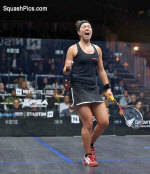 Moverley started strong, winning the first game 11-5, but the Frenchwoman roared back to grab the next two. Moverley played her way back into contention by denying Aumard the opportunity to hit any angle shots, cutting off her attacking game. Using the high cross court lob especially effectively, the 28-year-old Englishwoman evened the match at two all, and hung on for an 11-9 fifth game win. 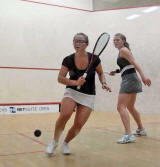 England’s Millie Tomlinson upended higher-ranked Irishwoman Aisling Blake in a hard- fought, four-game match in which the two women played similar attacking and physical games. In the end, the 23-year-old from Duffield made less errors, hit tighter shots and was ultimately more determined to get to the ball and into the main draw. 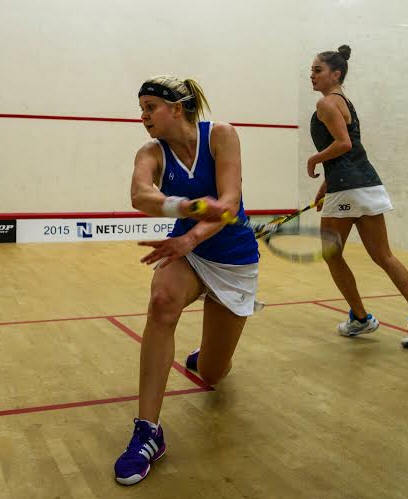 New Zealand’s Amanda Landers-Murphy stifled a late third game surge from American veteran Latasha Khan to earn her spot in the main draw. 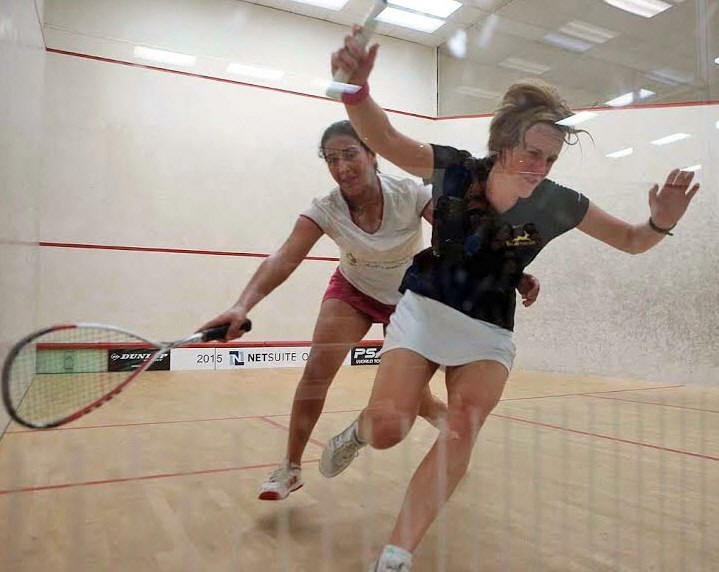 Pakistan’s Maria Toorpakai Wazir, who now resides and trains in Canada, dispatched Nouran El Torky of Egypt in four games to claim the women’s main draw final spot. 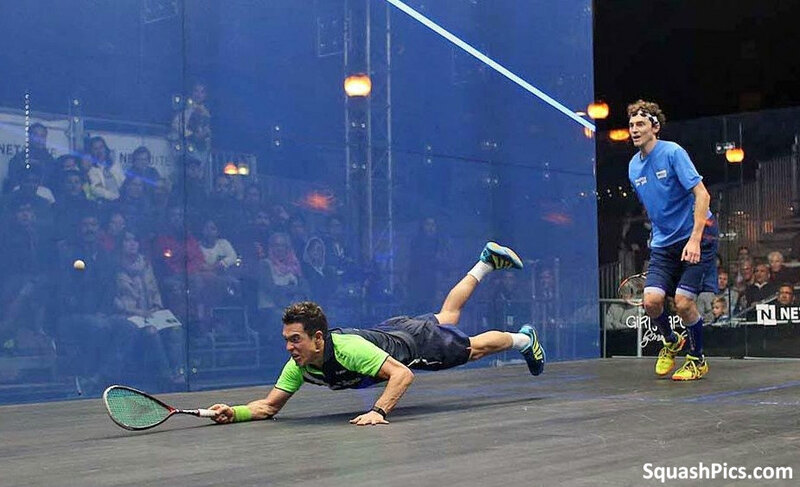 Two-time US Intercollegiate champion Ali Farag and 25-year-old Gregoire Marche provided the spectators with “edge of your seat” excitement as the players seized upon every opportunity to attack and chased down seemingly ungettable shots throughout their spirited and sporting match. After an hour and ten minutes of full throttle play, the 23-year-old Egyptian emerged victorious when the Frenchman ran out of gas in the fifth game. 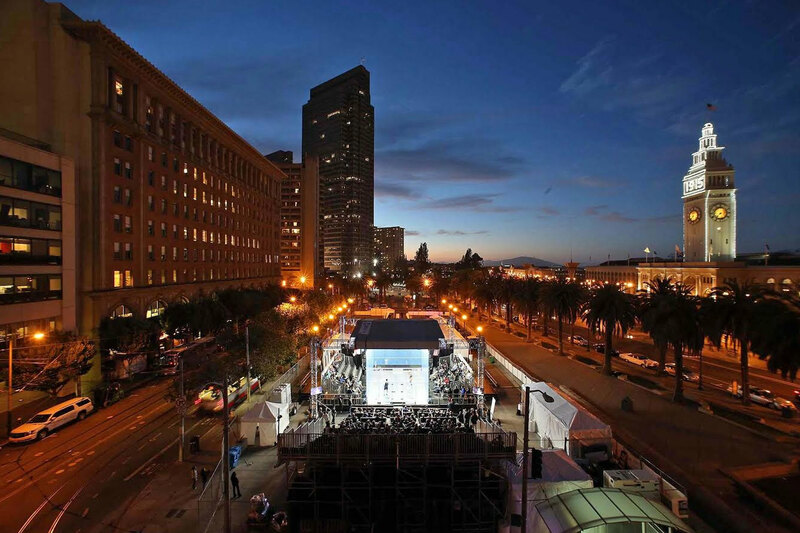 Australia’s Ryan Cuskelly, who plays and trains in New York City, eliminated the highest ranked player in the qualifying draw when he dispatched Alister Walker in three games, while Cesar Salazar of Mexico defeated Dutchman Laurens Jans Anjema in straight games. 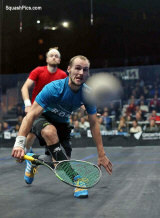 Englishman Tom Richards and Scotland’s Alan Clyne treated the fans to classic squash, as both players hit pinpoint shots to all corners of the court. 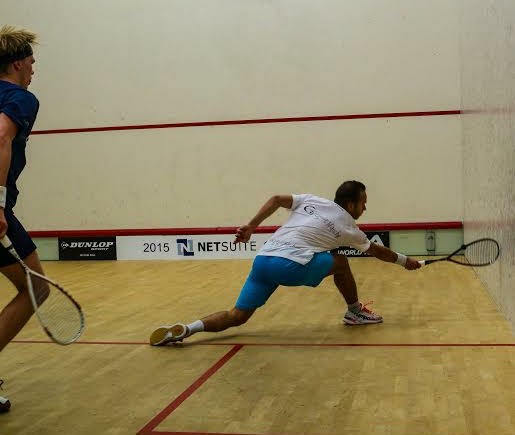 Tight rails and front corner drop shots were countered with lobs that dropped into the rear corners with no pace. Clyne drew first blood, taking the first game. Unbowed, Richards took the second to even the match and eked out the third game at 12-10. 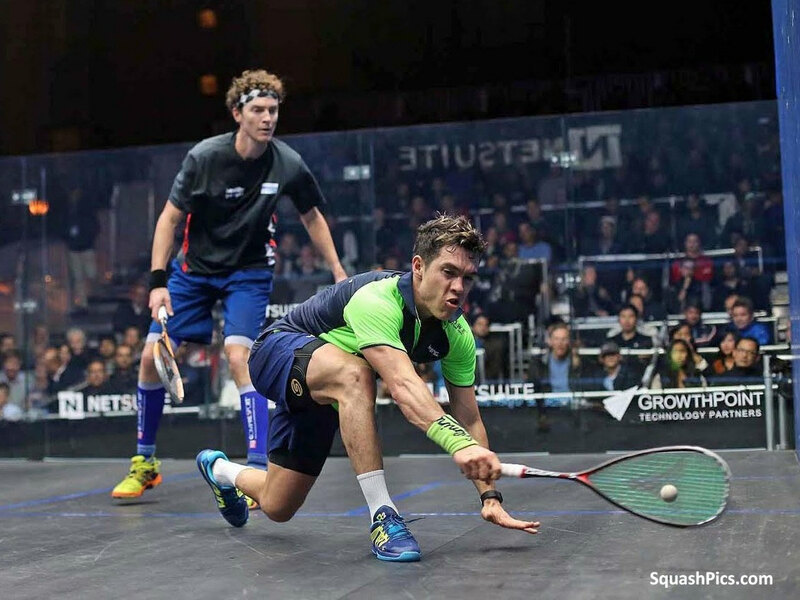 The relentless pace of the match took its toll first on the Scotsman who started to fade at the end of the third and Richards closed out a decisive fourth game to earn his place in the main draw. 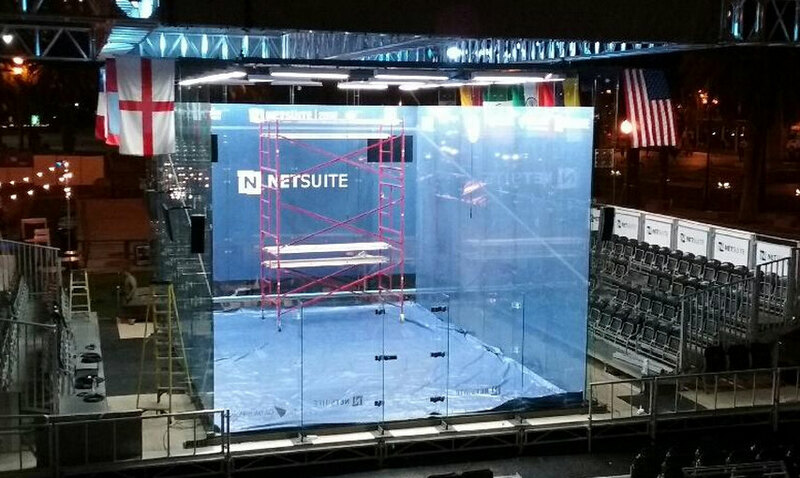 The NetSuite Open Squash Championships got underway with all the seeded players prevailing in their opening matches in the qualifying draws played at the Olympic Club, the Bay Club - San Francisco and the Bay Club – Marin. Although top seed Coline Aurnard of France dropped the first game to Brazil’s Thaisa Serafini, the Frenchwoman rebounded to win the next three games decisively. She will play England’s Fiona Moverley who dispatched Belgian Nele Gillis in three games. Fourth seed Nouran El Torky of Egypt and Maria Toorpakai Wazir of Pakistan will play for a spot in the main draw after easily defeating their local opponents, Jessenia Pacheco and Tara Arya. Veteran USA player Latasha Khan of Seattle eliminated fellow American Madeleine Gill and will face off against second seed Amanda Landers- Murphy of New Zealand who dispatched local player Mariam Kamal. 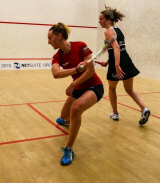 Another local player, Toby Eyre, lost to third seed Aisling Blake. 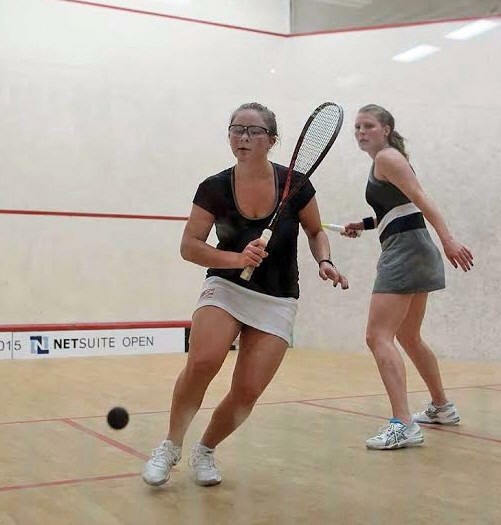 The Irishwoman will next face England’s Millie Tomlinson who defeated Canada’s Hollie Naughton in three games. 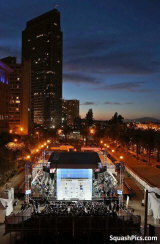 A mix of veteran players and rising stars won their matches in the men’s draws. World #23 Alister Walker needed four games to dispatch Mexico’s Alfredo Avila and will next take on Australia’s Ryan Cuskelly who defeated American Chris Hanson in straight games. It took four games with two injury timeouts for Egypt’s Ali Farag to defeat Abdullah Al Tamami of Qatar. The Harvard graduate and two-time US National Intercollegiate champion will next face France’s Gregoire Marche who claimed three closely contested games from Finland’s Henrik Mustonen. Nine-time US national champion Julian Illingworth was defeated by Mexico’s Cesar Salazar whose next opponent will be Dutchman Laurens Jans Anjema. The former top ten player, who is returning the PSA tour after an injury hiatus, eliminated Germany’s Raphael Kandra in three games. 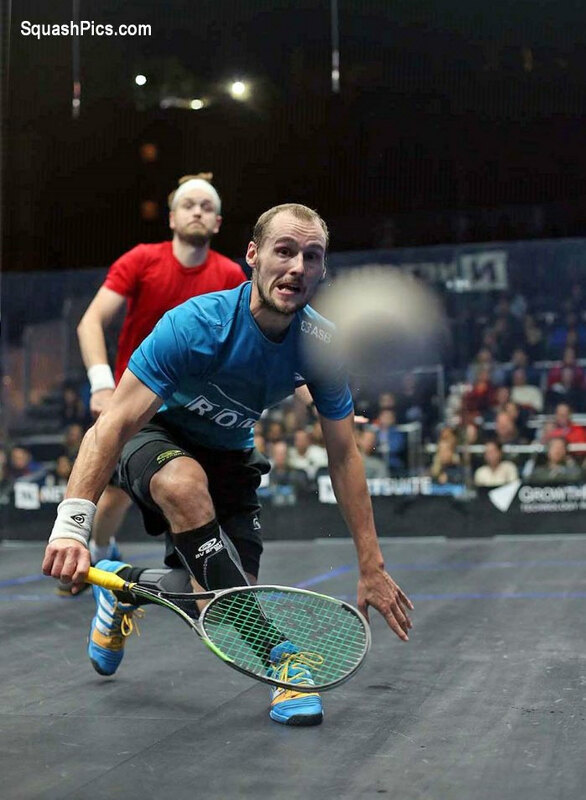 World #24 Tom Richards dispatched the Bay Club pro and fellow Englishman Charlie Johnson to set up a main draw determining match with Scotsman Alan Clyne after he defeated local player Gabriel Morgan. 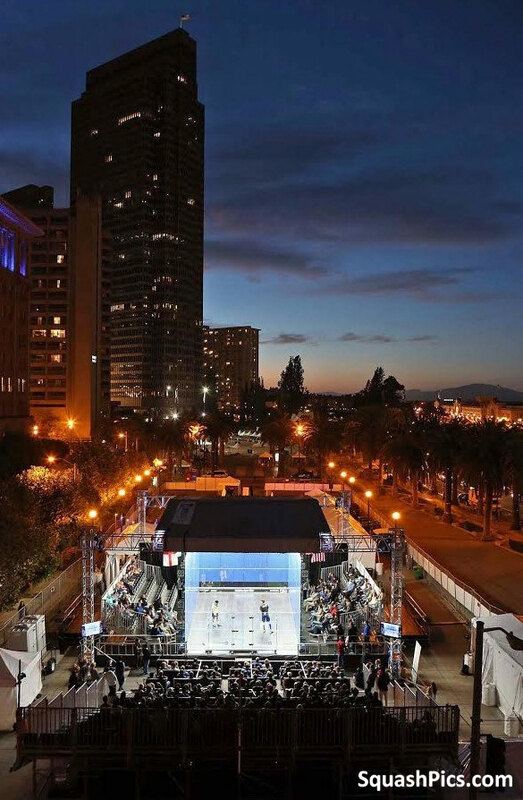 The Netsuite Open heads back to San Francisco for a fourth edition, with the later stages to be played out on the glass court at Justin Herman Plaza. 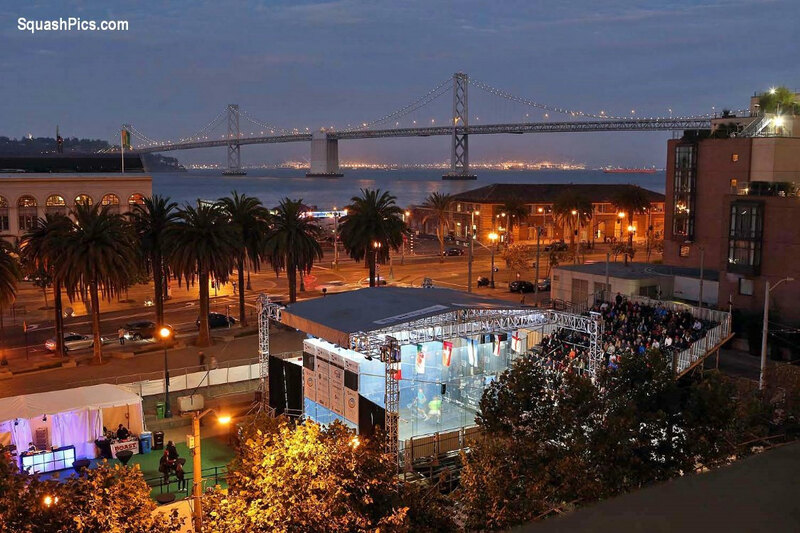 With four of the world's top five in the men's draw and US number one Amanda Sobhy top seed in the new women's event, squash fans in San Francisco are in for a treat.